The badge earner has a broad understanding of the Cloud Integration and Development portfolio, the IBM Cloud Integration platform offering, and the products that will provide solutions and value to clients who need to integrate on-premise, IBM Cloud and third party cloud offerings. They understand concepts of the API Lifecycle, Security, Application Integration, Messaging and Events and High Speed Transfer. They can recommend the best option/offering to address the client’s need for Integration. 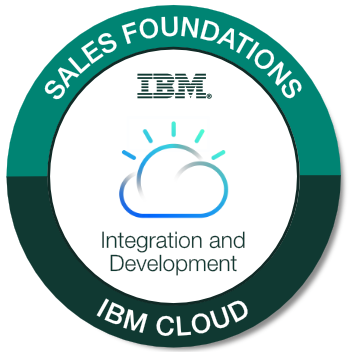 Optional: Review the Cloud Integration and Development Sales Foundations Learning Roadmap. Pass the Cloud Integration and Development Assessment Test with a score of 80% or higher.